My Friday mornings begin with challah baking. After putting the kettle on for tea, I pull out the stand mixer, sprinkle yeast and sugar into the bowl and pour warm water over it. As I make breakfast for the family, I breathe in the warm scent of yeast as it bubbles and foams. I love beginning the day this way! Listening to NPR is interrupted while the mixer kneads the dough for me ... such a wonderful time saver, allowing me to make lunches and help with the last minute rush of getting Bob, Sam and Isaac out the door for work and school. I then cover the mixing bowl with a kitchen towel, pour myself another cup of tea and go on to the next task of the day while the dough rises for two hours. Unfortunately, I was without my KitchenAid mixer for a bit. It stopped working when the plastic housing encasing the motor cracked. Argh! After researching online, Bob learned this was apparently a common issue with this particular model (Professional 600) when we bought it six years ago. Quite frustrating, as I’ve known KitchenAids to last for well over thirty years. Bob is resourceful, though, and ordered a metal housing piece to replace the plastic one and fixed the mixer for me. Woohoo! Now my mixer should last for many years to come. While without the mixer, I did continue to bake but did the mixing and kneading by hand. It was good to be reminded of the pleasures of creating dough with my hands, the relaxation of kneading and feeling the dough. Such a homey process! I realize there are times I want to make bread or cookie dough by hand. I don’t want to lose touch with the intimate feel of flour, fat and liquid combining to form something comforting. 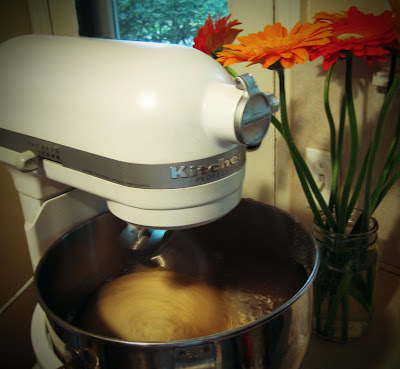 There are the times, though, when a particular bread dough requires the dough hook of a stand mixer or you want to whip up a big batch of cookie dough. And you certainly can’t beat the time saver of having the dough kneaded for you while you attend to something else. I welcomed my mixer back with open arms and am happy to have the choice of mixing by hand or stand once again. So what is the first dough I mixed up? Challah! 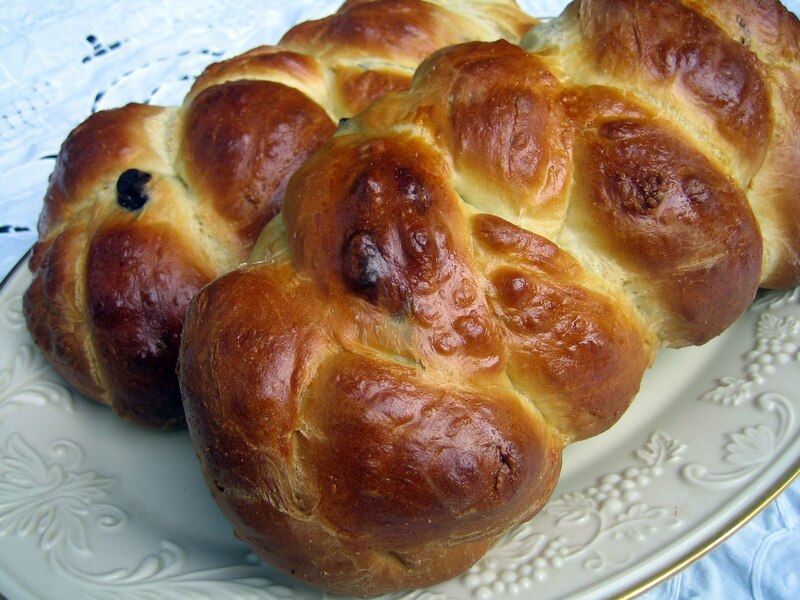 Every Friday evening we celebrate Shabbat. After lighting candles and blessing our children and wine, we bless challah. 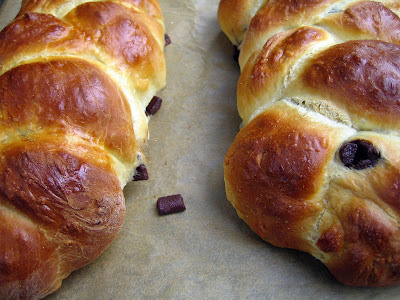 To make the challah even more special, I bake it with chocolate chips woven into the braids. 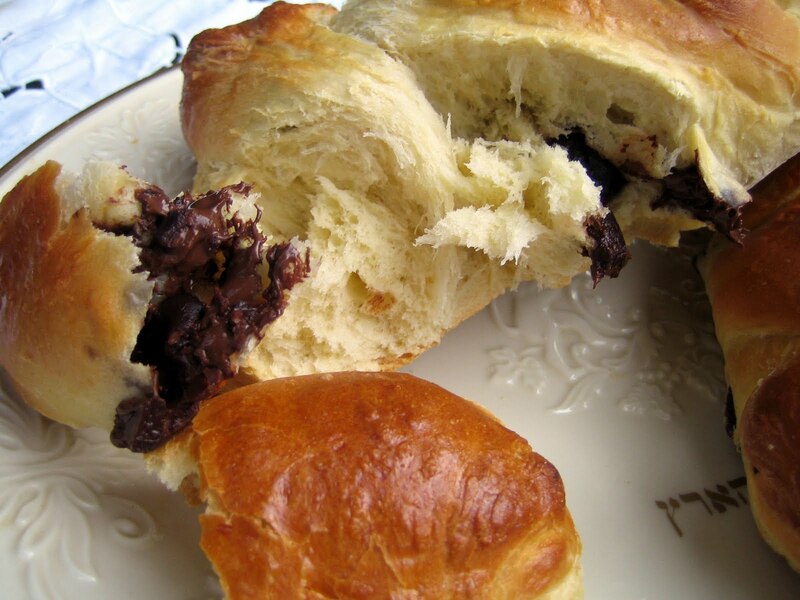 The chocolate melts and is gooey and fragrant when you pull off a piece of the warm, soft bread. The kids dive in and the adults are right behind. Mmmm, what a way to begin Shabbat dinner ... with chocolate bliss. I sit back and relax with a glass of wine and am content. And, needless to say, my tablecloth is always smeared with chocolate by the end of the evening! Ah well, a small price for an enjoyable Shabbat dinner. In a large mixing bowl or the bowl of your stand mixer, add the yeast, gently pour the warm water over and let sit until the mixture begins to bubble, about 5 minutes. Add the oil, honey, 4 eggs, salt and 4 1/2 cups of flour. Mix with a wooden spoon (if mixing by hand) or with a dough hook on low speed. When combined, begin to knead with your hands or increase the speed to medium on your stand mixer and knead for 10 minutes. This is a very soft, sticky dough and it is tempting to add too much additional flour to make it more manageable. Add up to 1/2 cup more flour if it is very difficult to handle but no more. This is where mixing in a stand mixer makes the process easier. Scrape down the insides of the bowl with a dough scraper so a ball is formed. Cover the bowl with a kitchen towel and set in a warm place to rise for about 2 hours ( I preheat my oven to the lowest setting, then turn the oven off and pop the bowl in and close the door – just remember it’s in there if you have other baking to do!). Sprinkle some flour on a surface to knead. When the dough has about doubled in size, punch it down, and with floured hands pull it out of the bowl. Gently knead the dough (it should be easier to handle now) and divide into 2 halves. Cut each half into 3 portions. Roll the 6 portions into ropes about 10 inches long , flatten each rope a bit and lay a generous row of chocolate chips on each. Lightly push the chocolate into each rope and pinch the dough around to seal it in. You will have 6 chocolate chip filled ropes. Cover a baking sheet with parchment paper and preheat the oven to 375 degrees. To create each loaf, braid 3 ropes together, pinching the ends of the loaves and tucking under to seal. Place the loaves on the baking sheet and let rise for about 30 minutes. Mix the remaining egg with a few drops of water and brush the egg wash onto the loaves. Bake the challah loaves for 30 minutes. Remove from oven and let cool on the baking sheet. 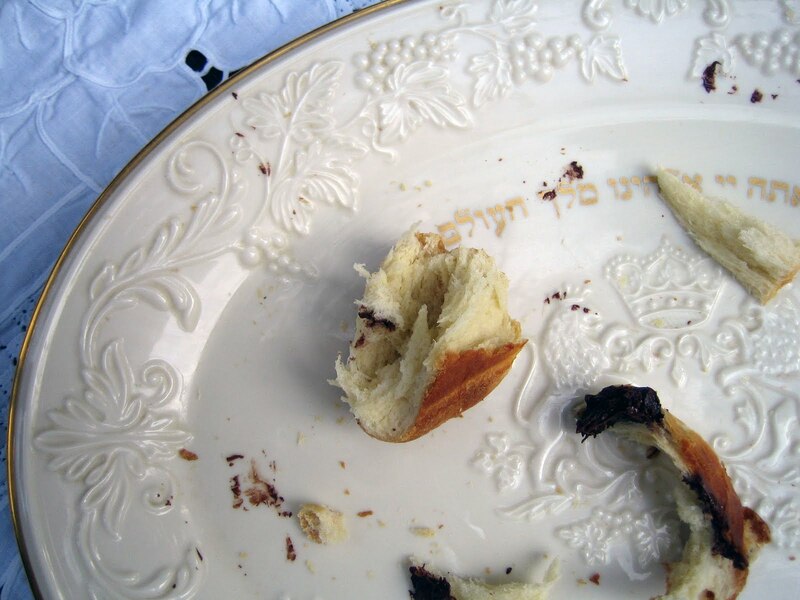 **If you have any leftover, it makes divine French toast the next morning! I'm so happy you found the replacement part for your mixer. And I must admit, I am a bit jealous of your Friday mornings: NPR, tea and challah making. Pure perfection. I'm with cheapbeets--NPR, tea and challah sounds like a fabulous combination. I love challah and used to buy it from an artisanal bakery in Oklahoma City, but I haven't had any since we've moved to Kansas. I guess I need to get into the kitchen and make some! Thank you! I am very grateful for my Friday mornings and love that time. Let me know if you make the challah, Lauren! I hope you like it.